Where do I use my Fusion Living voucher code? 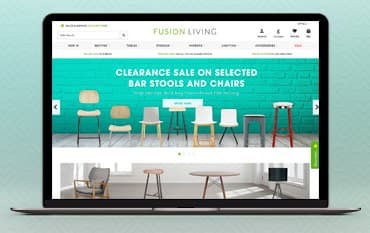 Fusion Living stock a vast range of homeware including chairs, bar stools, lighting, clocks, dining tables, storage and more and in a whole range of styles and finishes. Their products are ideal for all kinds of uses including home interior, show homes, retail, offices, for event hire and exhibition companies, cafes, bars, restaurants, hotels, universities, student accommodation and more. You can save a ton of money on your furniture and interior accessories with a discount code from us. Pair the already affordable products from Fusion Living with a code or deal from us and you can make incredible savings on your order. For extra price reductions check out the sale section at Fusion Living too. Fusion Living proudly stocks a wide range of furniture and accessories to add that extra touch of style to your home, including a brilliant collection of seating. All of the seating products featured on the Fusion Living website are produced to meet high standards and are delivered to your door for an affordable price. Discover all kinds of chairs including plastic, wooden, metal, industrial, desk, restaurant, upholstered, stackable, swivel, glass lift and high back chairs and stools. Tables are often the centrepiece of a room, and can really add style and character to any space in your home. At Fusion Living you'll find a variety of stylish tables including coffee tables, console tables, desks, dining tables and side tables. All the tables available at Fusion Living are extremely affordable and come with great savings too. If you are looking for on-trend tables or table sets on a budget you can check out the options available in the sale section, or you can use one of our discount codes to cut the cost of your order. If you are looking for something innovative for your home, then look no further than Fusion Living. Their extensive range offers contemporary, classic, vintage and retro style furniture collections, so you are sure to find something you love. Whether you need new Furniture, Mirrors, Lighting, Cushions, Coat Stand or something else, you'll find a great choice of products, all offering something different to those found on your average high street.